Even though knotweed is a List A invasive species, and clearly has a presence in Colorado, I'd not worked with it before last year. You know how it goes with plants, you read about a particular plant all the time, but it isn't until you see it with your own eyes and learn to recognize its pattern that you start seeing it everywhere. That's precisely what happened with knotweed. 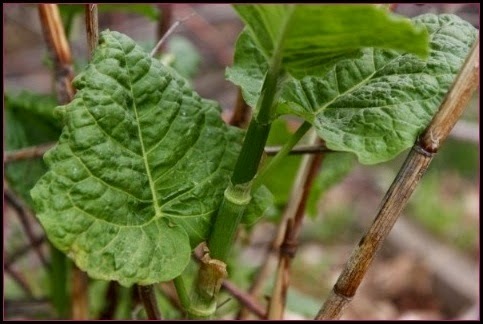 At one point last spring, without even being at the location, something just clicked and I realized the plant with the largest leaves I'd ever seen in the state, the one that I'd observed for years in one of my asparagus spots, was giant knotweed. Once I put the pieces together, it only took one look at the plant to confirm the ID. 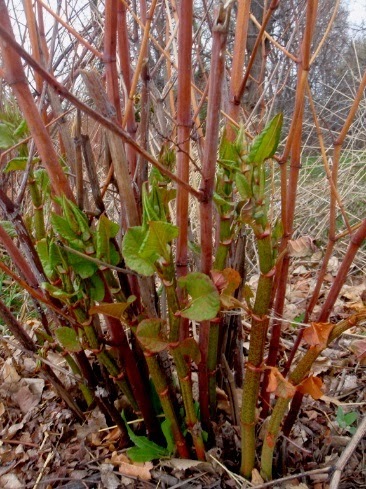 Spring is the time to take advantage of knotweed as a food because the stalks are most tender. Look for dense thickets of last year's tall brown stalks. The new shoots will be pushing up at the base of those stalks. Before the leaves unfurl, those new shoots look somewhat like giant asparagus, with clearly visible joints. In the areas I've seen, giant knotweed shoots are purely green on the outside, and Japanese knotweed shoots are speckled with pink. If you snap one off, you'll see that it's hollow inside. To learn more about knotweed (Fallopia spp.) and how to identify it, read Green Deane's account of it, or look to the 3 Foragers, who have a lot of great recipes using this plant. The April 2015 edition of Wild Food Girl's Wild Edible Notebook explores knotweed as well. Also good to know, Ellen Zachos says that you can freeze knotweed. Because it is considered invasive in most places, you can pick a lot of knotweed to eat without breaking anyone's heart. Do be careful though, as its status as an invasive species means that patches are more likely to be sprayed. Knotweed is pleasantly crisp and has a sour flavor that some say is lemony and others more like green apples. 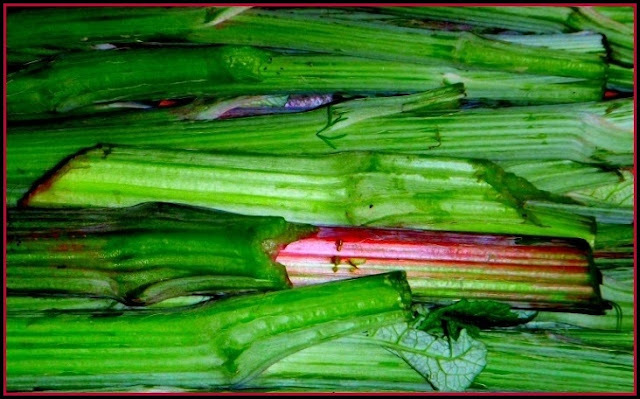 You can get a lot of mileage by using it in recipes in place of rhubarb. Last year, I made knotweed quick pickles. I wasn't happy with the way they tasted because of the vinegar brine, but knotweed showed itself to be excellent pickling material, staying crunchy and absorbing flavor well. This year, as soon as I nabbed my first knotweed shoots, I wasted no time in taking another shot at pickles, this time lacto-fermented. The resulting pickles are outstanding - crisp, full of flavor, and bathed in a perfectly salty-sour brine. For this recipe, I use the basic method outlined by Sandor Katz in Wild Fermentation. 1. Dissolve the salt into the warm water, and let it cool to room temperature. 2. 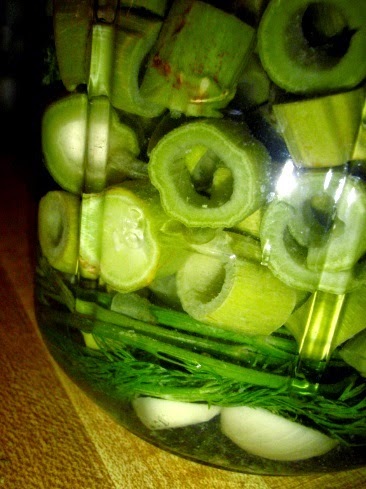 Sterilize two quart jars, then divide the garlic and dill between them. 3. Now divide the knotweed between the two jars. 4. Add enough of the salt water to cover the knotweed by an inch or two. 5. Sink something (again, sterilzed) into the top of the jar to keep any of the knotweed from floating up to the surface. I have some drinking glasses that fit into the tops of my jars that do the job well. You could also use river rocks, or any other object that will fit. Some people use a plastic bag filled with more brine. 6. Let the knotweed pickles ferment in a cool place for 4-7 days, until they are as sour as you please. Store them in the fridge afterward. I so want to try this. You may have solved my too-strong pickle brine dilemma. Thank you so much for these instructions! I liked the pickles you made last year with the vinegar so I'm sure I'll like these even better. Cheers. I also made a knotweed pickle recipe, it was wonderful. I used Indian spices, including star anise, ginger and others. 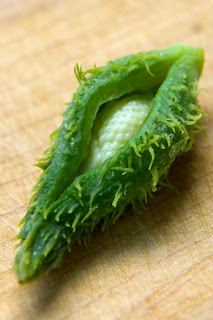 I really like to use raw or lightly balanced knotweed in place of tomatillos. I think the flavor profile is spot on! I made this with purslane and it turned out great! My question is can I reuse the liquid instead of making it Al over again?